Just take a look at the daily adverts or Google suggestions, you would find ubiquitous adverts welcoming you to the great resorts and exotic dolphinariums for a great SWTD (Swim-with-the-dolphins) experience. A fishy kiss or a dolphin ride (the dorsal tow) from these social and intelligent creatures. SWTD actually dates back a long time. And humans have been interacting safely with these amazing creatures for centuries now. Even ancient Greek stories tell of shipwrecked sailors being rescued and carried to shore by these creatures. Over time, it has gained popularity and developed into a booming business in the Caribbean. In fact, over 30 dolphinariums are known to exist in the region with new ones underway. But, what are the pros and cons of such a venture. Is swimming with dolphins beneficial to us humans? And what of the dolphins? How does it affect them? The Pros And Beauty Of Swimming With Dolphins. Dolphins are known to offer therapeutic benefits to humans as proposed by Dr. John Lilly, who studied the effects of dolphins on individuals with disabilities. His findings indicated positive results as people with disabilities experienced more freedom of movement underwater. Besides, it also appears that dolphin sonar wave relaxes our brains from an active state to a meditative brainwave pattern. And what’s more, the money you pay may help fund research and raise conservation sanctuaries all around the world. For instance, DolphinQuest has donated millions to help cetacean conservation and fund research worldwide. 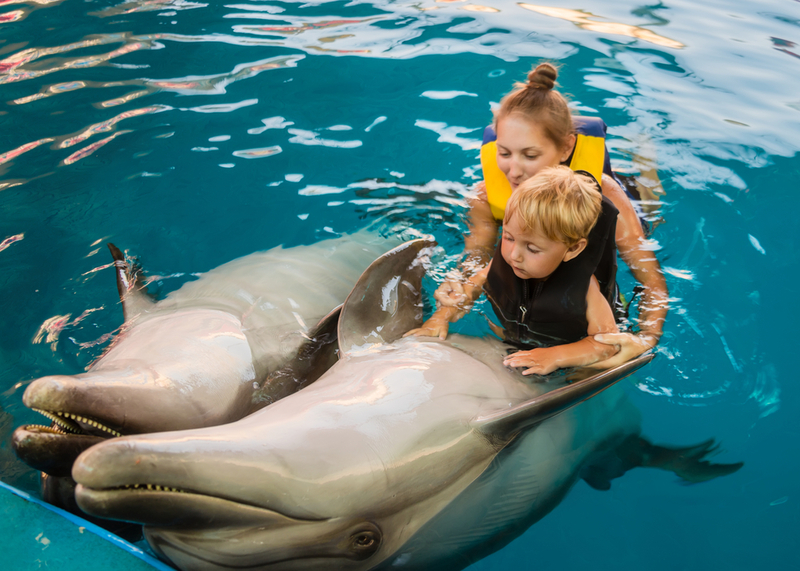 Marilee Menard, executive director of the Alliance of Marine Mammal Parks and Aquariums claims captive dolphins are often more successful than their wild counterparts. Their interactions with humans create an emotional connection with the people that care for them. In addition, operators of marine parks say that they provide the dolphins with top quality food, exceptional veterinary care, and protection from extreme hazards they would have faced out in the wild, including predators. Billy Hurley, general manager of Marineland, in St. Augustine, Florida adds to the support for dolphin captivity. Though many may consider dolphins as wild and would love to swim in the seas, in reality, they are looking for food, and when they find an easy meal at hand, they happily stay. The fact is that most SWTD facilities use captive-bred dolphins. We have spoken extensively on the negative aspects of dolphin captivity and the issues are too serious to ignore. Therefore, Billy’s claim has raised controversies with animal rights groups. For one thing, people are known to feed dolphins with anything they have at hand; some of which might not be a dolphin’s diet. Furthermore, continuous feeding of dolphins might cause a behavioral change where dolphins depend entirely on people for food, which can jeopardize their survival. Similarly, the rising market for SWTD has created a niche which gets filled mainly by wild dolphins, often illegally captured. The hunting methods may not be as extreme as rounding up of dolphins in Japan, but research indicates a wild bottlenose dolphin’s chances of mortality increases with captivity. When fishing for these wild dolphins, the best are selected and lifted to the ship. Diana McCaulay, CEO of the Jamaica Environment Trust (JET), which is against dolphinariums in Jamaica says female dolphins are preferred as they are more trainable. The less “favorable” ones are slaughtered and sold to unsuspecting customers. Worse is when setting free injured and bruised dolphins from entanglement in nets. Their injuries weaken them and may cause them to die from lack of energy to hunt or they get eaten by predators. Naturally, dolphins exist in complex social groups called pods. The social organizations are so complex that they form lifelong bonds. Captivity alienates individual members of a pod, including babies that rely on the adults for most of their early life. At the dolphinarium, confinement in groups with other non-family member dolphins often results in what could have been avoidable conflicts. A wild dolphin can swim up to 40 miles in a day 80 percent of that distance underwater. Certainly captive concrete pools can’t offer such freedom. When you go down into the water and come in contact with a dolphin, there is a high chance that you might trade diseases, like Salmonella. Remember dolphins are born wild creatures and thus their primitive instincts, though trained, never go away. It’s not impossible that they might get aggressive and even “mark” you. You might also sustain broken bones, injuries, bruises or bites. Furthermore, fingernails and rings can bruise a dolphin’s delicate skin. Though people can provide a certain degree of diversion and stimulation to a dolphin, it does not match up to the ocean life, claims Toni Frohoff, a marine scientist, and consultant for animal welfare groups. Captive dolphins have a lower survival rate than in the wild where they naturally communicate with their kind as they roam, hunt, mate, and play. In a 2010 paper, “The captivity in the Caribbean,” Whale and Dolphin Conservation (WDC) documented sightings of unusually “dark” dolphins. This coloration was linked to sunburns from shallow pools at resorts and hotels, isolated dolphin training centers, and highly polluted water which heightens illnesses and disease levels. Though the ponds are frequently cleaned and disinfected, the chlorinated water is harmful to the animals. Courtney Vail, a campaigns and program manager at WDC, adds that interaction with humans can heighten anxiety. Rules and regulations governing dolphinariums exist in the Caribbean, but most dolphinariums work under the radar with no oversight. It’s not possible to control everyone that gets in the water with these dolphins. Some eager tourists are fond of harassing the creatures in a bid to take selfies and pictures. There are cases of swimmers lifting dolphins out of the water just to take pictures! One can only imagine what other indignities these marine mammals have to endure daily. The SWTD experience may have beneficial effects on you and you may actually have good intentions. However, to the dolphin, what goes on behind the scenes emains controversial and will probably always be that way. So, will you decide to go swimming with dolphins or not?